Four lots were considered so important to Vettius Valens that they marked out effective houses in the chart. These four lots were also the only ones which he mentions using in the context of his Valens-style profections. In this article, we’ll be exploring these 4 lots in depth. In addition to their significance, we’ll also look at predictive usage, including in the context of the Clinton-Lewinsky scandal. In Chapter 16 of Book II of The Anthology, Valens gives 9 special topical names to certain places of the chart. These places are largely identified by houses, but 4 lots are used as well. This shows that Valens assigned a particularly special significance to these 4 lots in the chart. Of the many lots used by Valens, only these 4 lots seem to be used on a par with the primary 12 houses in terms of importance. In Book IV of The Anthology, Valens discussed profections. There are only 4 lots which he profected around the chart (see introductory quote). In fact, Valens sets aside an entire chapter of Book IV, Chapter 25, “The Distributions of the Four Lots”, to provide more details about the significance of the annual profections of just these four lots. These lots represent two significant topical polarities in life. First, there is a polarity between the physical and the abstract. There are things which befall us on a physical level, from our bodies to accidents to children. These contrast with that which befalls us on a more abstract level, from our minds to social relations to spirituality. Fortune (also known as the Lot of the Moon) pertains to the physical while Spirit or Daimon (also known as the Lot of the Sun) pertains to the abstract. Secondly, there is the dynamic polarity, so dear to the philosopher Heraclitus, of Love and Strife. Harmonious constructive alliances bring things together while dissonant destructive divisiveness pulls things apart. The Lot of Love is a place of alliance while the Lot of Necessity is a place of competition and distinction. These four powerful lots are all derived from the locations of the Lights, the most powerful planets of the chart (the Sun and Moon). The most important lots, Fortune and Spirit, are projections of the distance between the Lights. The other two, Love and Necessity, are projections of the distance between Fortune and Spirit. The importance of these lots reflects the power and importance attributed to the Lights in Hellenistic astrology. This principle of abstraction vs. tangibility is reflected in the common names for the lots of the Lights, Fortune and Spirit. The Ancient Greek term for Fortune, “tuche”, referred to more passive chance happenstance. The term for Spirit, “daemon”, referred to things brought about by spiritual machination. These same terms pertain to the four houses of the natal chart where the benefics and malefics have their Joys. Diurnal planets have their Joys above the horizon, while nocturnal planets have their Joys below the horizon (Mercury’s Joy straddles the horizon, i.e. the 1st house). 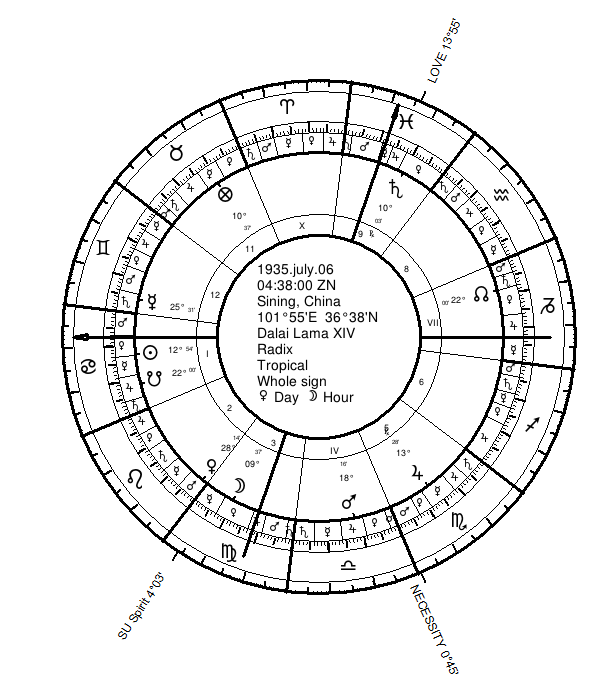 The Joy of the diurnal benefic, Jupiter, is the 11th House, which is called Good Spirit. The Joy of the diurnal malefic, Saturn, is the 12th House, called Bad Spirit. Good Spirit pertains to friendship and other generally beneficial social and mental phenomena. Bad Spirit pertains to betrayal, enmity, and other generally challenging social and mental phenomena. Opposite those two houses are those of their nocturnal counterparts. The 5th is the Joy of Venus, which is called Good Fortune. The 6th is the Joy of Mars, called Bad Fortune. These nocturnal Joys are more associated with passive physical phenomena. The passive phenomena is pleasant and productive in the case of the 5th (Good Fortune), as it signifies children and pleasure. However, it is challenging in the case of the 6th (Bad Fortune) which signifies illness, accidents, and slavery. Now let’s look at what Valens says about the significance of the Lots of Spirit and Fortune. Consider how they compare with the Spirit and Fortune house meanings. We find that Valens associates Fortune with the body and physical skill, while Spirit is associated with the mental and spiritual, as well as social exchange. This accords with the significance of the spirit houses (11th and 12th) which associate with social/mental benefits and obstacles, as well as the fortune houses (5th and 6th) which associate with physical/sensual benefits and obstacles. Interestingly, the 11th place from Fortune has a meaning related to being the Good Spirit (11th place) relative to physical happenstance (Fortune). It is called by Valens, “… the Place of Accomplishment, the bestower of property and goods, especially if benefics are in this place or in aspect” (Valens, Anthologies, Book II, Ch. 21, Riley trans., 2010, p. 35). Thus it becomes possible to derive an interpretation in which good social activity relative to physical happenstance means circumstances in life in which tangible gifts are conferred to the native. This allows us to analyze themes that may coincide when this place is active. There is a specific predictive technique involving Fortune and Spirit whih was employed by Valens. Today it is commonly referred to as Zodiacal Releasing. 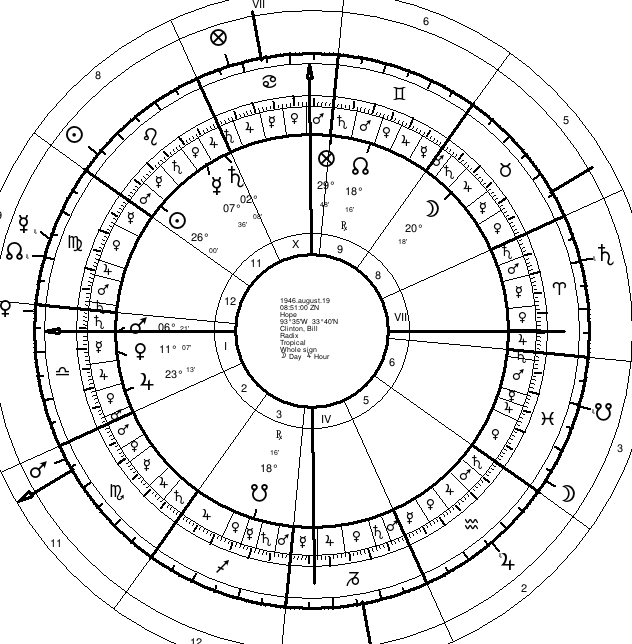 In Zodiacal Releasing, the Lots of Spirit and Fortune are the primary points which are moved around the chart (circumambulated) to establish time lords. These time lords relate specifically to physical/sensual circumstances (releasing from Fortune) or mental/social circumstances (releasing from Spirit). Let’s look at what Valens had to say about the significance of releasing from Fortune and from Spirit. Similarly, Valens in his delineations of various Spirit configurations of Zodiacal Releasing associates the times when Spirit comes under malefic influence with mental instability and professional overturn. He even takes into account the element of the sign occupied by the released Spirit’s ruler in the natal chart; fire shows nervous breakdown and acting against one’s will, air shows distraction and worry, etc. This shows that, for Valens, Spirit is not just about profession (i.e. social signification) but also about mental life, consistent with his analysis of the two lots in general. 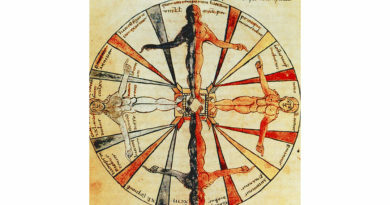 When looking at profections of Spirit and Fortune in Book IV, Valens considers that one’s work may change form depending on connections with Fortune and Spirit. One’s work may become more physically involved if more planets become associated with Fortune than Spirit, while more mentally involved when more planets incline toward Spirit. At this point we have grasped the key polarity of the first pair of principal lots. The active, the ideal, social rank, and the mind are associated with Spirit, the Sun, the diurnal sect, and the houses above the horizon. The passive, the mundane, the tangible, and the physical body are associated with Fortune, the Moon, the nocturnal sect, and the houses below the horizon. Now let’s look at Fortune and Spirit in delineation, by turning our attention to the chart of the current Dalai Lama. 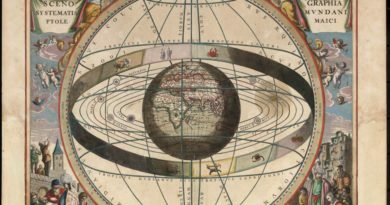 We want to pay particular attention to the ruler, planets in the place, and planets in the stakes of the place (the 10th, 7th, and 4th places from the place – those that oppose or square the place). For the Dalai Lama we find Fortune in the 11th, the place of the Good Spirit. It is in Taurus, ruled by the sect benefic, Venus. The place is empty though it has Jupiter and Venus in its stakes (Jupiter actually scrutinizing the lot). Therefore, there is overall indications of general good health and enjoyable physical circumstances. Additionally, Fortune is closely aspected (i.e. within 3 degrees) by both Lights, Jupiter, and Saturn, connecting it particularly with loftiness, power, and administration. Where Fortune has difficult potential is in the close overcoming sextile from Saturn, the out of sect malefic, in the 9th of travel and religion. Spirit is in the 3rd House, Goddess, the Joy of the Moon, in Virgo. It is ruled by Mercury, and in the bound of Mercury. Spirit is with the Moon and dominated by Mercury (Mercury is in the stake that is in a superior square), while opposed by Saturn. The overall indications for intellectual, professional, and social circumstances are that there is a great deal of communication (Mercury, 3rd), analysis (Mercury), congregation (Moon), and frequent travel (Moon, Mercury, 3rd). The fact that the sect Light is with Spirit and in its Joy suggests particular importance and power associated with the professional and intellectual affairs. Saturn again shows a potential challenge in this area through its opposition. Remember in the Valens quote above that in Zodiacal Releasing Fortune is used primarily for physical pleasures and ailments while Spirit is used primarily for social/professional peaks and valleys. For the Dalai Lama we are particularly interested in profections to and from Spirit and releasing from Spirit. We know less about health crises and pleasures in his life. Let’s look at Valens-style profections involving Spirit. The Dalai Lama was recognized at age 2, which is significant as the year in which the Ascendant (self) profected to the 3rd place. The 3rd place is occupied by both Spirit and the sect light (the Moon), showing a very pivotal time for personal prominence. Additionally, at that time, Spirit and the Moon (i.e. 3rd house) profected to Jupiter in the house of Good Fortune (the 5th). Also at that time Fortune profected to the Sun in the 1st House of the self and identity. Therefore, many profections signalling prominence and loftiness of station occur at age 2 when the 14th Dalai Lama was recognized as the incarnation of the previous Dalai Lama. Now let’s look at the other two principal lots, Love and Necessity. There has actually been some confusion as to how to calculate these two lots. The Project Hindsight translation of Valens left out the note in the original Greek in which Valens (2nd century CE) provided instruction in calculating the lots. In fact, the Project Hindsight translation didn’t even mention that note in the original. This has caused many astrologers to assume that the lots of Love and Necessity mentioned by Valens are the same as the Lots of Venus and Mercury which Paulus Alexandrinus (4th century CE) called Love and Necessity. However, the lots mentioned by Valens are not the ones discussed by Paulus. The calculation of the lots is explicitly given in the text and is included in the original Greek in the critical edition by David Pingree (see pages 191-193 of that edition). The most recent English translation by Mark Riley includes a translation of the note on lot calculation which was lacking in the Project Hindsight translation. In addition, to examining the Greek of the Pingree edition and finding the calculations, I have been assured by Chris Brennan that the Valens calculations are in the original Greek. Valens is the older source. The fourth century astrologer Paulus Alexandrinus named seven lots for the planets. These are known as the “Seven Hermetic Lots of the Planets”. Fortune and Spirit were the Lots of the Moon and the Sun. The Lot of Venus is called “Love” by Paulus and that of Mercury is called “Necessity”. However, Paulus referred to different lots with different formulae than the Lots of Love and Necessity discussed by Valens. The confusion doesn’t end there. The 4th century Roman astrologer Julius Firmicus Maternus also mentioned them but gave the opposite formulae for the lots as Valens. More on that below. Valens gave the formula for Love as from Fortune to Spirit by day (reversed by night), projected from the Ascendant. Necessity is from Spirit to Fortune by day (reversed by night), projected from the Ascendant. One can find the Valens instructions at the bottom of p. 90 of the 2010 Riley translation which was made available for free on Mark Riley’s faculty web site. This makes sense when we think of Spirit as the Sun Lot and Fortune as the Moon Lot. Movement from the non-sect lot to the sect lot is found in the Valens formula just given for Love. If one is born during the day, then we go from the Moon Lot (Fortune) to the Sun Lot (Spirit), and project that from the Ascendant, as Spirit is the “sect lot”. By night, we go from Spirit to Fortune, and project that from the Ascendant. This is consistent with the rationale discussed above for a lot which shows more ideal circumstances to involve movement from passive to active, from dark to light. Maternus gave the opposite formula for Love (see Mathesis, Book VI, Ch. 45, “House of Desires”); from Spirit to Fortune by day. This is inconsistent with the rationale discussed above. It is similar with Necessity, where in Valens (the earlier source) a rationale is evident that is lost in Maternus. In Valens, Necessity is from the sect lot to the non-sect lot, from the more active to the less active, from the light to the dark. Again, Maternus gives the opposite formula and one without sound rationale (see Mathesis, Book VI, Ch. 46, “House of Necessity”). Therefore, to find the Lot of Love in a chart it helps to think of Spirit as the Lot of the Sun and Fortune as the Lot of the Moon. Find the distance from the non-sect lot (Fortune by day, Spirit by night) to the sect lot (Spirit by day, Fortune by night). Project this from the Ascendant in the same direction you measured the distance. To find the Lot of Necessity in the chart, merely take the same distance and project it in the opposite direction from the Ascendant. This is the same as taking the distance from the sect lot to the non-sect lot and projecting it from the Ascendant. Valens, in Book II, Ch. 16, attributed “desire” to the place of Love, and “enemies” to the place of Necessity. Looking at his delineations of their use in time lord techniques we can expand upon these central notions a bit. Love describes the nature and circumstances which accompany desire and getting together, such that malefics will connect it with scandal or unsavory things and benefics with powerful alliances. Necessity describes the nature and circumstances which accompany dispute and competition, such that malefics will bring failures and attacks while benefics will bring victory and put power on one’s side. There is such a nice symmetry or polarity to these concepts, in which one pertains to the attempt to conjoin and the other to the attempt to oppose. We briefly looked at Fortune and Spirit in the Dalai Lama’s chart. One thing that is interesting is that the 9th House of God (religion, spirituality, wisdom, higher education) is the place of Love in the Dalai Lama’s chart, and is ruled by Jupiter. While some information can be gleaned about general baseline trends and themes from delineation of the lots in the natal chart, their true strength is in predictive work, such as profections, releasing, and even transits to the places of the lots. One particularly striking example came to me from a friend of mine who had a very eventful day in which he both started a relationship and was arrested at a protest. It all occurred on the day of the last solar eclipse this year! Born in December 1984, he was 27 when the events transpired. Therefore, the annual profection of the Ascendant was to his 4th place, Gemini. Mercury was the Lord of the Year, and Gemini was the activated sign. Gemini happens to be the location of both the twelfth-part of his Venus (at about 14GEM) and his Lot of Love (at 25GEM). The Lot of Love itself had profected to the 7th of partnership, Virgo, also ruled by Mercury. On the afternoon of May 20th, 2012, there was a solar eclipse at 0 Gemini, the sign of the annual profection, Love, and the twelfth-part of Venus. Our friend started a relationship with someone that day. Later in the day, he was arrested at a protest. Besides the solar eclipse itself bringing forth the significations of Gemini in his chart, there were also some interesting transits. 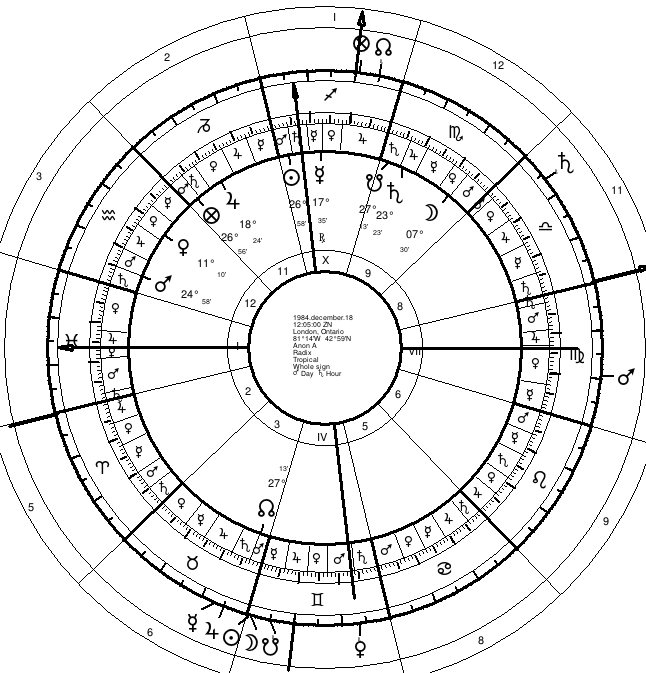 For instance, transiting Venus was in Gemini at the time and conjunct, within 3 degrees, his Lot of Love, right on his IC. Mercury, the Lord of the Year, was transiting conjunct transiting Jupiter. Mercury was also appropriate for the arrest. As transiting Mercury was opposing the native’s 9th house Saturn and squaring the native’s 12th house out-of-sect Mars, all within 3 degrees, at the time of the arrest. The Clinton-Lewinsky scandal pertains both to getting together and disputes with enemies, so Love and Necessity are naturally involved. Bill Clinton was born with the Lot of Love in the 7th of partnership, which may intensify Love’s themes. Unfortunately, Love is ruled by the out-of-sect malefic, Mars, and is opposed by the amorous Mars-Venus conjunction in Clinton’s 1st house. Love is complicated for Clinton as its ruler is both prominent and malefic, though it is with both benefics. Clinton has Necessity in his 6th house, Pisces. It is ruled by the sect benefic, Jupiter, which is prominent in Clinton’s first house. Jupiter signifies generally fortunate outcomes and assistance in competitions or disputes. 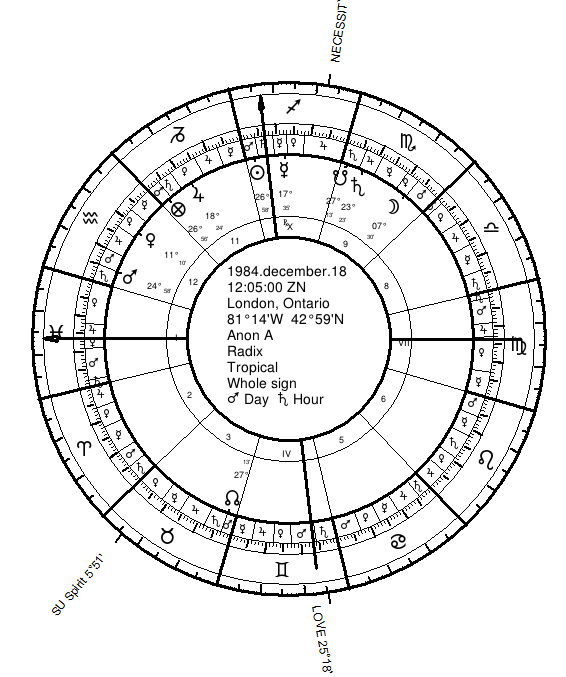 As Jupiter is with Mars (the ruler of Love), and they both are with Venus, there are some interesting connections between Love and Necessity in Clinton’s chart which revolve around his character (1st house) and sexuality (Venus). 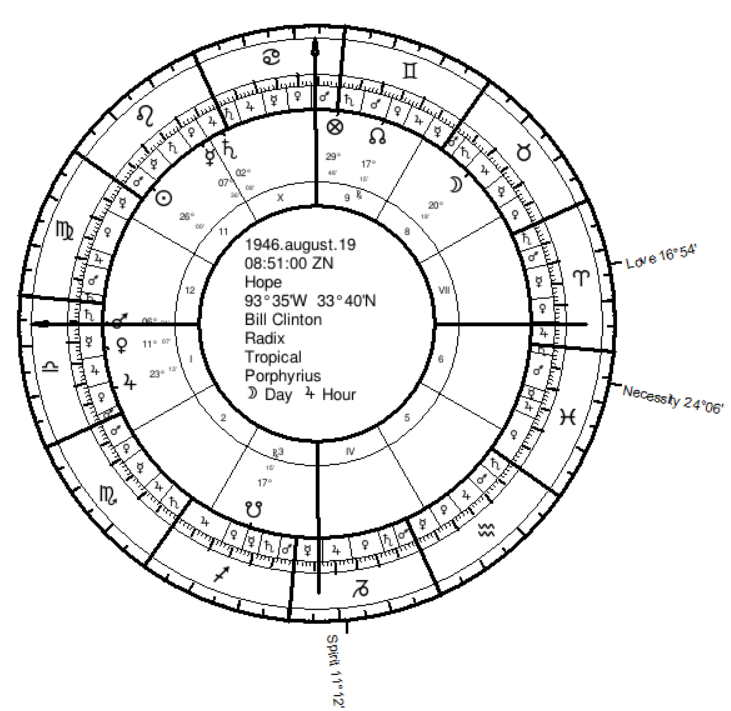 Clinton’s natal chart is below. In late 1995, when Clinton was 49 years old, he started having sexual relations with an intern, Monica Lewinsky. The Lot of Love had profected into the 8th house, Taurus, ruled by Venus and occupied by the Moon, both out of sect. Venus shows the sexuality, and the Moon and the 8th show the personal and private nature of the activity. The relationship continued into early 1997. After Clinton’s birthday in 1997, things started taking a turn for the worse as Linda Tripp began secretly recording phone calls. The whole thing broke to the media soon after, in January of 1998, when Clinton was 52 years old. The profection of the Ascendant was to the 5th House, Aquarius, ruled by Saturn. The profection of Love was to the 11th House, Leo, ruled by and occupied by the Sun, as well as occupied by Saturn and Mercury. Therefore, there was a particular emphasis on Saturn, which as a baseline is not a bad indications in Clinton’s chart because it is in sect and in the place of Good Spirit, but it does indicate that Saturn is the focal planet for the year (i.e. lord of the year). However, at the solar return we find Saturn, Lord of the Year, in the place of Love and closely conjunct the Lot of Love. It is also opposing Clinton’s 1st house Jupiter. In January 1998, when the story broke and Clinton made his infamous public denial of sexual relations, transiting Saturn was actually in adherence (applying conjunction within 3 degrees) to Clinton’s natal Lot of Love. It was in Winter of 1998, when Clinton was 53, that a major battle began. The House voted to issue articles of impeachment over his perjury and obstruction of justice. At Age 53, the Ascendant profected to the 6th house, Pisces, with Jupiter as Lord of the Year. The 6th place is also the place of Necessity in Clinton’s chart. Therefore, the Ascendant had profected to Necessity the year when the articles of impeachment were issued. This signifies some prominent engagement with enemies/adversaries. Necessity profected to the 11th, Leo, ruled by and occupied by the Sun, but also occupied by Saturn and Mercury. The solar return was rather promising as far as vying with enemies would go, because Jupiter in the return was in the place of Necessity, Pisces, its domicile. At 26 Pisces and moving retrograde, it was actually adhering to the Lot of Necessity at 24 Pisces. Additionally, Necessity’s profection to the 11th was bolstered by the benefic Venus transiting through the place. So while the profection of the Ascendant to Necessity brought a divisive struggle to the forefront, the indications were of victory over enemies. That is exactly what happened when the Senate voted to acquit Clinton of of the impeachment charges issued by the House. In this example, we see how the lots of Love and Necessity can provide deeper indications pertaining to human relationships. Fortune and Spirit echo themes of the 1st house of self, but distinguish the tangible (Fortune) and the intangible (Spirit). Similarly, Love and Necessity pertain to 7th house themes of relating. Important friendly and adversarial social interactions can be separately examined. We can study the evolution of these interactions over time with predictive techniques. Additional work is needed to explore the usage of these very important lots in things like evaluating political contests. They may prove to be quite useful in all areas of astrology, including mundane, electional, and horary. For instance, a great deal of horary questions concern attractive or adversarial human relationships. Fortune, Spirit, Love, and Necessity allow us to dig deeper into the topics of the self and relationships. There is one final matter concerning the lots of Love and Necessity which it is appropriate to address here. Valens discussed a Lot of Basis which pertains to personal power and leadership skills. Basis is examined with Fortune and Spirit, and another lot, the Lot of Exaltation. When these lots and their rulers occupy each other’s places it indicates personal power and social mobility. The Lot of Basis is always either the Lot of Love or the Lot of Necessity. Whichever one of these is under the horizon is Basis. Love and Necessity pertain to human relationships and the houses under the horizon pertain more to physical substance. Therefore, the lot under the horizon may show the type of social interaction (friendly or competitive) with the greatest impact on social standing. With my limited usage of using Basis for examining social mobility, I can only speculate. Many reader already had a passing familiarity with Fortune and Spirit, but were not familiar with Love and Necessity. You should now have a sense of their usage and the great importance placed on these lots by Valens. I hope you’ve become inspired to start using the four principal lots, and to investigate the use of more lots. 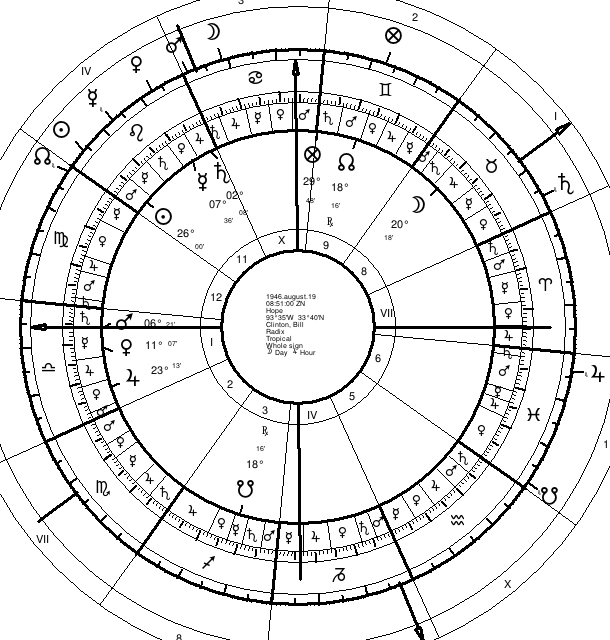 There are actually over dozen lots which were commonly used in Hellenistic astrology by multiple astrologers. The lots have a utility for establishing topics that allows for more fine-tuned topical analysis. We will be exploring more important lots in future articles of this series. 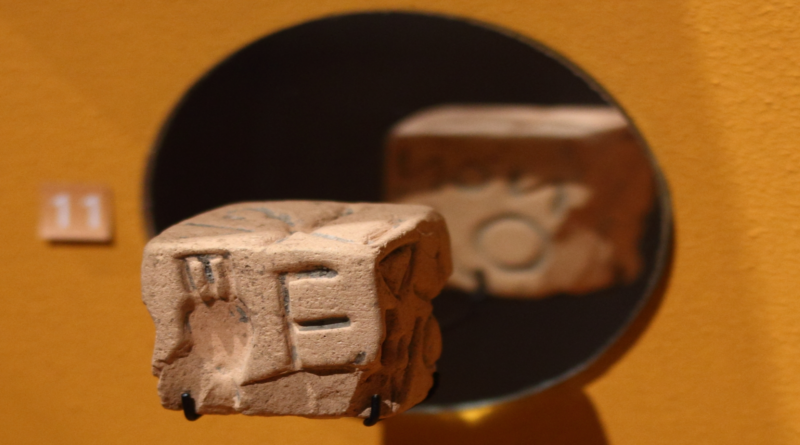 Featured Image of terracotta dice is in the public domain. ← Transit of Venus 2012 | A Ray of Hope for Gay Marriage in the U.S.A.
Is there a postal address where I could send a donation? Thank you for considering a donation. Blessings to you. One to print out and file for later study and referral! Thanks!